Romeo and Juliet gets rewired through streetwise signifiers in new comic Prince of Cats, a postmodern remix of Shakespeare’s Verona that careens into Afrika Bambaataa’s “Planet Rock” and Prince Paul’s hip-hopera A Prince Among Thieves. 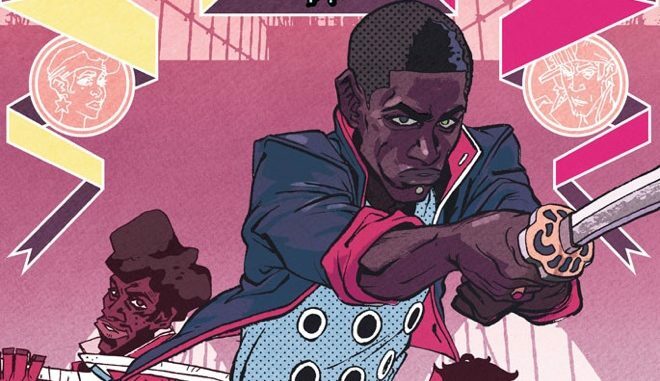 Time-warped into the 20th century and written from the perspective of Romeo’s chief antagonist Tybalt as his gang jams across rooftops and into tragic beefs, the expressive debut comic from writer and artist Ronald Wimberly is also a shout out to hip-hop’s timeless culture. Prince of Cats, released Tuesday, has as much love for cult film The Warriors as it does for Enter the Wu-Tang (36 Chambers). Like many culture vultures, Wimberly is something of a reboot specialist. His art gracefully brought to life actor and rapper Percy Carey’s transformative hard-knock life in the Eisner-nominated comic autobiography Sentences: The Life of MF Grimm. Wimberly’s work also fleshes out Adult Swim’s animated blaxploitation bow-down Black Dynamite, and he’s also collaborated with Spike Lee, whose classic hip-hop cinema like Do the Right Thing is stacked with Shakespearean tragicomedy. So it makes sense that Lee’s landmark Nike commercials as well as Shakespeare’s timeless poetry — which, like hip-hop, is another populist tongue with major staying power — are both quoted in the preview pages above. Click through Wired’s exclusive gallery above and let us know in the comments below if you’re feeling Prince of Cats’ flow.